Riding a bike is much more than a hobby and a way to stay physically fit– it’s a nice way to take a breather from the accelerated urban lifestyle that seems to dominate these days. In other words, it helps you stay mentally fit, as well. Sometimes, though, taking these breathers means riding a trail with stunning scenery, but which is not all that close to your home. This, in turn, means that you have to drive to wherever you’d like to ride, and it’s where having a bike rack comes in handy. If you’ve ever had to squeeze in your bike inside your car, then you know why. 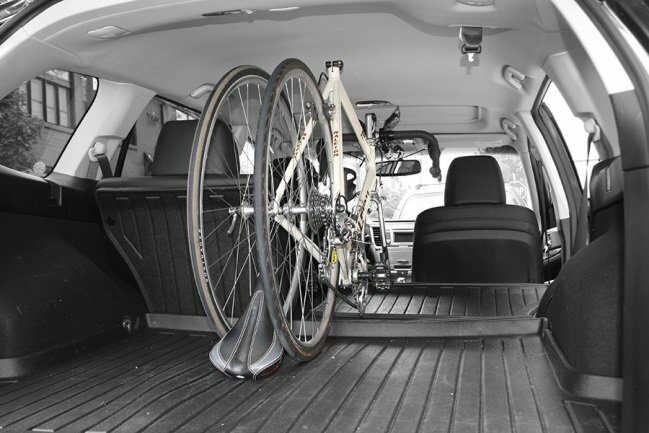 The disadvantages of an inside car rack are obvious – it’s still trying to squeeze the bike inside your car, and you’ll invariably have to detach the front wheel to minimize its profile. On the other hand, this does mean that it won’t be plastered by bugs, make you worry constantly about clearance or falling off, and/or worry about its being stolen like you would if you had an externally mounted outside rack (think hitch, trunk, rooftop). 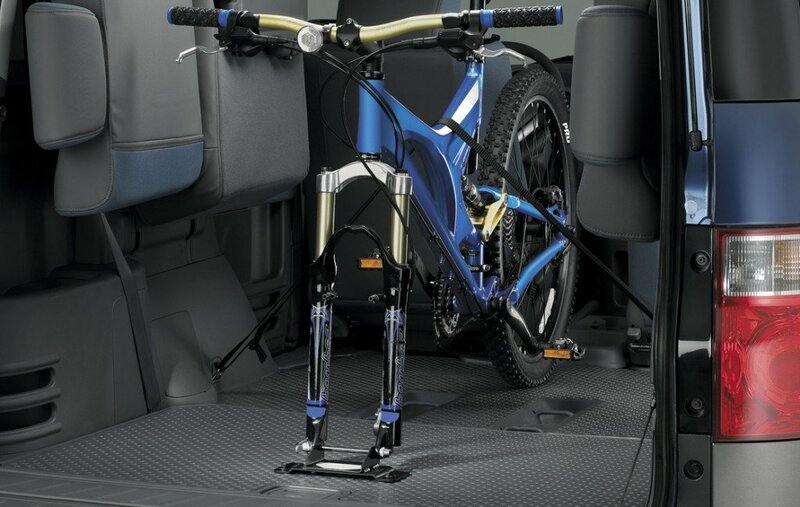 To make your decision easier, we prepared a selection of the best inside car bike racks. The Saris Traps Triple Track (got to love the alliteration) means can be mounted to the floor inside your station wagon, hatchback or SUV, or to the truck bed of your pickup. As far as the former three go, the two things you need to be careful about are height and length – make sure you measure both the trunk (with back seats down) and the bike (with the front wheel off) to see if it fits, but if you’ve got a pickup, the only thing to worry about is the length. This covers the bikes, but to see if the rack fits, you’ll have to measure the width, too. Not to worry, though, as most inside car bike racks will fit most cars, and the same goes for the Saris Traps Triple Track. It’s made of about 47 inches of powder-coated aluminum frame (49 if you count the ), 2 inches wide and as many inches tall. The rack can hold up to four bikes, and, best of all, it easily mounts on any wall. The frame holds the bikes in an upright position, locking on to the fork using fork-mount traps. However, both this and the wheel mounts sell separately, which is a bit of a disappointment. Still, it’s great value for the money, and you do get a sizable capacity for the whole family. 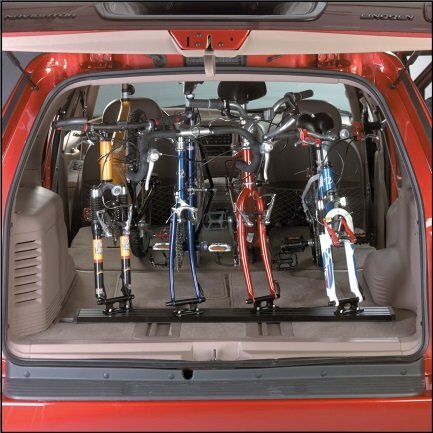 The Minoura VERGO-TF2 Interior Car Rack for Bicycles is pretty much what it reads on the tin, and it’s affordable, at that.Just cut off your kids’ allowance for a month, and you’ll have saved enough to get the rack. On a more serious note, however, the VERGO-TF2 is a great choice for a family car like a station wagon or hatchback. It’ll also fit any SUV, and it doesn’t even require bolting or screwing down to remain in place, thanks to its anti-slip urethane rubber feet on either side of the frame. Speaking of frame, it’s about 52 inches in length, while the whole structure (feet and frame together) is 8 inches wide and 6 inches tall. It fits up to two bikes, clamping down on the fork. One fork mount is 9mm, and the other 15mm, both being fully adjustable to the length of the frame, so you can space the bikes whichever way suits you to maximize the use of space. Moreover, the mounts swivel and are able to handle up to six different handlebar positions, which gives you even more maneuverabilityin terms of space usage.The wheel mounts are optional, as is the equipment to convert it into a bike stand, both being sold separately. A word to the wise – when you take measures to see if the bikes will fit, take into consideration the fact that your tailgate might have an angled window, meaning you’d have to move the rack slightly to the front to accommodate for this. The Hollywood Racks T970 Fork Block is the master of versatility. Thanks to its simple and practical design, it can serve as an inside car rack, floor mount, wall mount, truck bed mount, whatever jingles your jollies. It’s ridiculously easy to install, and even easier to adjust. Moreover, it comes pre-assembled, so all you need to do is fix it to whatever surface you like.Speaking of fixing, the whole setup is quite heavy duty, from the skewer, through the frame and to the bolts used to hold it down to whatever flat surface you have available. Granted, it’s fairly modest when it comes to capacity, as one piece holds a single bike, but then again, it’s cheap as dirt, so you can have almost four times as many T970s for the price of a single high-end rack (which will have up to four mounts for as many bikes, at most).As with most any inside car bike rack, the T970 grabs your bike by the fork (using a 9mm skewer), so you’ll need to detach the front wheel. This will also significantly lower the bike’s profile, so it’ll be easier to fit it inside your car. Still, watch out for angled windows on tailgates. As far as the wheel goes, you’ll have to splash out some extra if you want a mount for it (or just lay it flat on the carpet, that works fine, too). Much like its 47-inch cousin, the Saris Traps Triple Track(35-Inch) is made in the US and comes with a limited lifetime warranty, which in and of itself speaks volumes about the quality. The rationale here is that if a manufacturer is willing to put so much backing behind a product, it’s got to be worthwhile.The rack ismade of powder-coated 6061-T6 aluminum, and measures 35 inches. It’s compatible with Saris traps and wheel holders, but these sell separately, which amounts to about another two-thirds of the initial rack price, so be sure to factor that in, as well. The rack mounts by laying it flat on the floor of your station wagon, hatchback, SUV or the truck bed of your pickup. It’s fairly lightweight, so you might want to bolt it down permanently, or be careful about weight distribution when mounting the bikes. 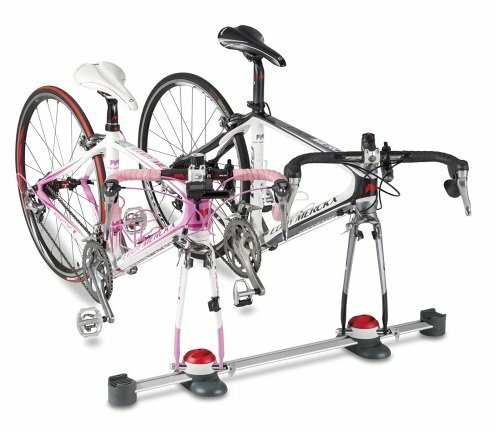 Speaking of which, the rack can fit up to 4 bikes, and you will need a thru axle adapter if you want to use it with a bike that has them. The succinctly named CycleRest Interior Rack is exactly what you’d expect – a bike rack that allows you to mount your bike inside the car. It fits most any hatchback, station wagon or SUV, provided the vehicle has two-post headrests.You’ll get the “why” presently. First thing you’ll want to do is measure the cargo area (with the back seats down), factoring in the possible angled window on the tailgate, as well as the bike dimensions (without the front wheel), to check for fit.The seats have to fold forward (which, luckily, in most cases they do) so that you can install the rack. Obviously, it goes without saying that such a design is far from ideal for permanent fixture, but the space does get used more economically. The rack is patent-pending as of writing this, so there aren’t many folks with enough experience to testify for prolonged use, but the principle is sound. You take the CycleRest clamp, open it and slide onto the headrest posts as if it were a choker. You may then fold the seat down, and proceed to mount the bikes, securing them to the mount as per usual.